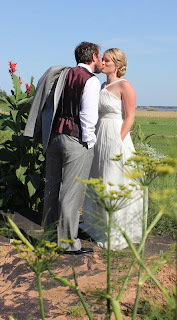 It's just a quick post to say we had a wonderful wedding. Even the rain didn't put a damper on it. Here is my son and his wife, just married. Can you tell how happy I am? 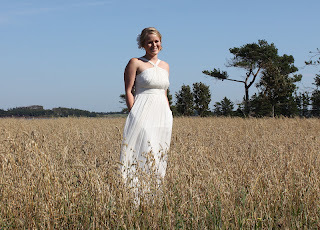 What a very special day it was! It's lovely to feel all the love and to have so many family members all gathered together. 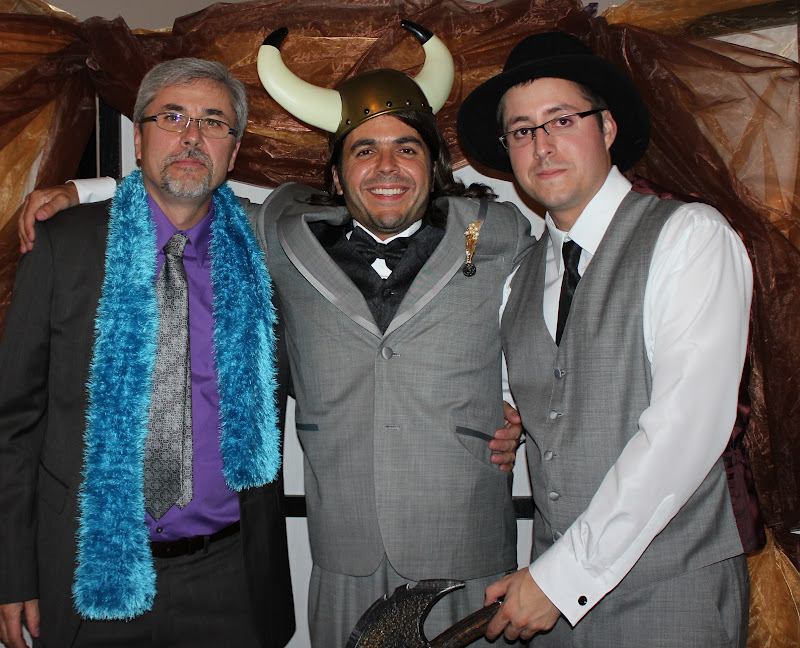 And we had fun dressing up for photos. This is my husband and two boys. We missed our daughter, but she wrote a lovely letter which my youngest son , who was the man read. He was so nervous all day, but he gave the funniest speech ever with nary a tremor in the voice. 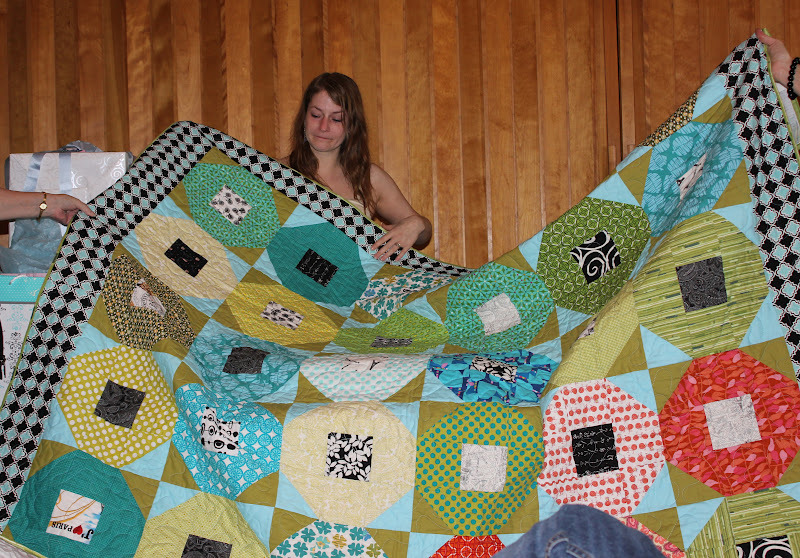 Karine got pretty teary eyed when she opened the quilt. The centers of some squares had pictures from Paris. They visited Europe just after their university graduation. I just have to show the bouquet. 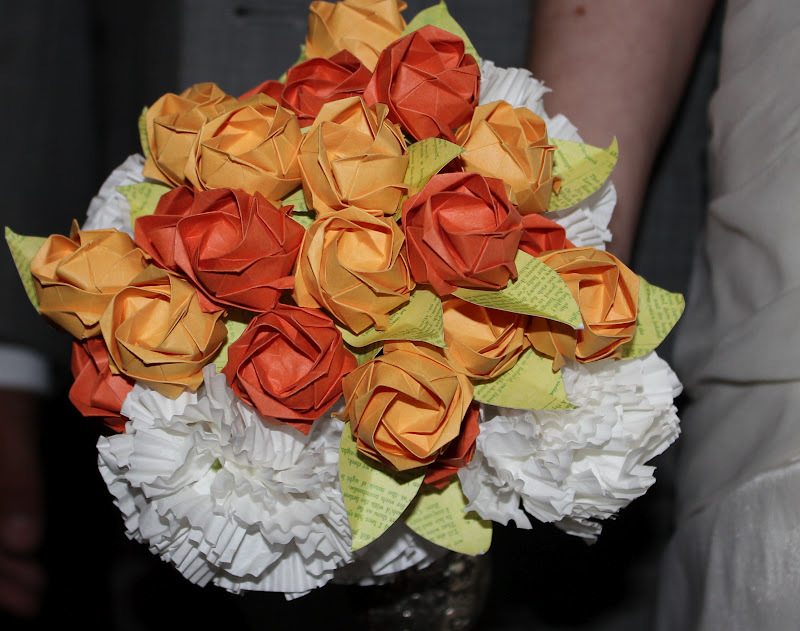 There were 3 that the bride Karine made. Can you believe it's made with Post It notes and cupcake papers? It was such a beautiful day that I gave up my studio time and went for a trail walk with my camera. Strolling along, I took the time to really look around me and took lots of pictures. It definitely was not a cardio walk! 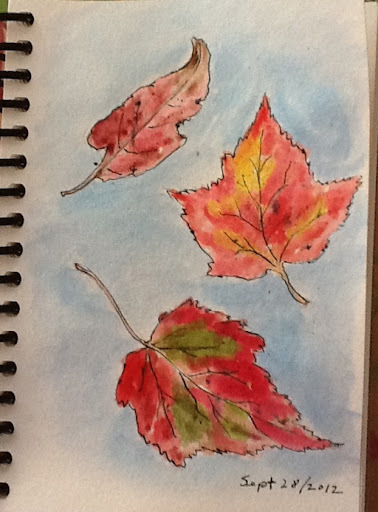 I came home with a handful of leaves and had just enough time before super to do this quick watercolour. 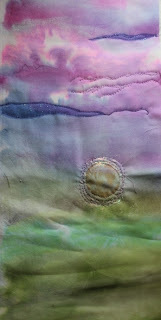 I'm not sure if you'll see enough detail on the blog to tell that I added a little bit of shimmer using the Silks paints. ( the green and gold areas). 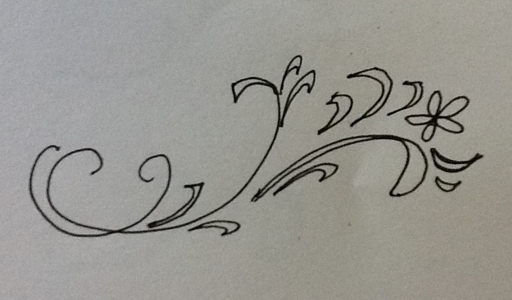 I'm going to want to do more of these as they are still quite tricky for me to handle. The leaves are still turning, so they'll be lots of opportunity. These 3 books arrived in my mailbox today. I'll take one with me on my overnight trip tomorrow for my son's wedding, probably won't have minute to read but just knowing it's waiting for me is exciting. 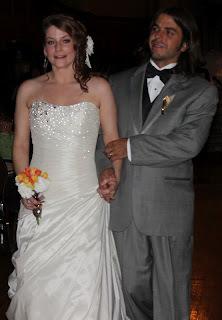 I shall have some wedding pictures early next week. In the last few weeks, I've had only bits and pieces of time to work. We have two weddings this month and thus two weekends on the road. My son's is this weekend. I've been sewing here and there. This morning, I went to my lap swim and then met a friend for lunch, so I was later than usual getting into my studio. The piece above is the one I showed last week. I added tulle, then removed it. I stitched Angelina around a moon, then wasn't sure I liked it. I had another narrower piece that I had cut off, so I decided to experiment with it. I added some paint to the moon and while it dried, I finished the 3 flowers in the triangle areas of the grey and purple piece. 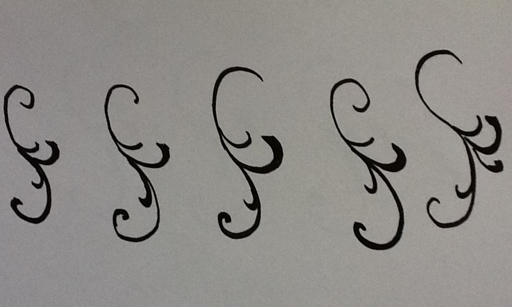 Also, I did 2 more feathers. I wanted to get back to the moon/planet piece as it is on my mind. I'm having trouble to express what I envision. I added Angelina fiber around the moon, stitched it with free motion then added some tulle. I stitched it and started adding a bit of free motion stitching when I ran out of bobbin thread. It was time to take a break anyway. I'm not sure about the Angelina fiber. I have some scraps of sparkly white tulle that I think might work but none are big enough. I'm hoping I'll have time to look for some on our way to the wedding Saturday. This morning I needed to do a bit of house cleaning. I've been neglecting some things. Every second or third time I have to vacuum more thoroughly but I've been putting it off for longer. So, I took my time with it and hing out my sheets as well. It's a perfect clothes line day, really I should have been out for a walk but I was too tired by the time I was done. 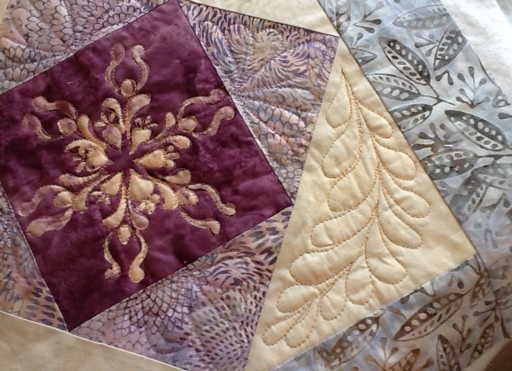 With the heating belt on my back, I sat down at my machine to do a little free motion quilting. I'm satisfied with my second ever feather, but the flowers that I did in the triangles, not so much. Two are good; two I'll rip out. The one I don't like is at the bottom of the picture. I'm not sure if you can see the detail of it or not. I almost always give a little lesson in what not to do, don't I? A little more practice on a sample might have helped, although sometimes you only notice the problem on the actual item. Yes, I did practice the shape and trace it out on the fabric first, but once I had done the stitching, I didn't like them. The next two I traced the way I decided they should be. 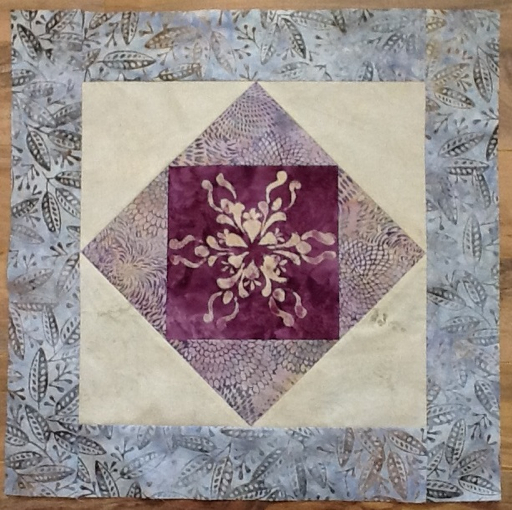 I also decided to add a thread stitched leaf to this piece. It is going to blogging friend. My husband actually said he liked it when I told him. That is quite rare for him to take notice of a piece. 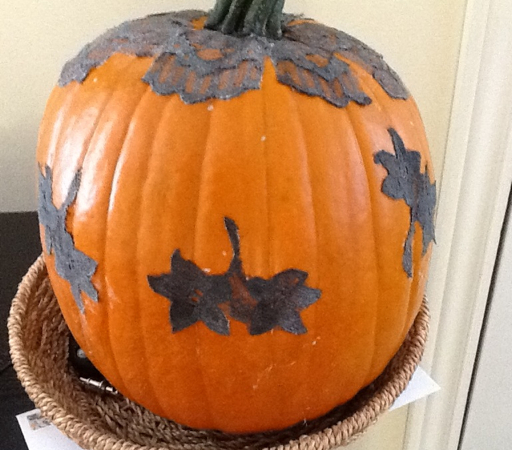 I found the idea for this pumpkin I'm doing for the front step in the latest Country Living magazine. The lace in their example was black. 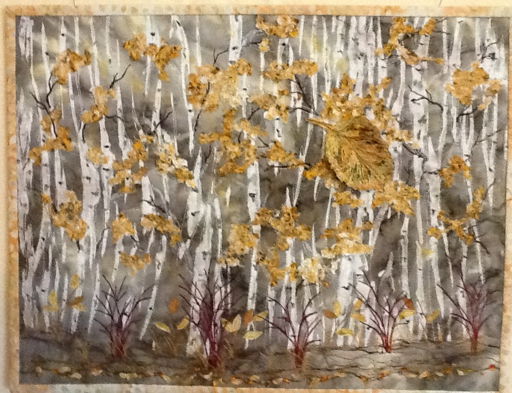 I have a bag of lace scraps, none of which were black, so I thought I'd simply paint it. It actually was a good idea except I couldn't find a drop of any black paint in the house. Always one to make do, I used grey. I attached it with a Tacky glue. Hmmm. I wonder if its water proof? So that was my day, a few starts but no real finishes except the housework. I'm tired out and I still have to put the sheets back on my bed! 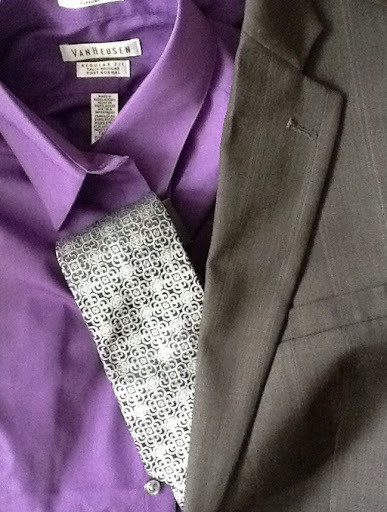 The first creative thing I did today was to take my husband shopping for a shirt and tie. It is one week before my son's wedding so it was about time. Do you love the colors? I particularly like the design on the tie. 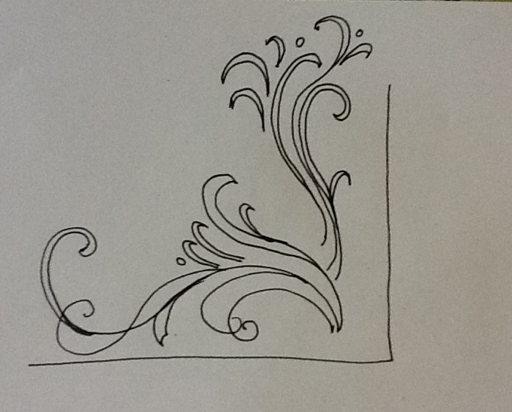 It reminds me of the designs I'm working on for a silk screen. 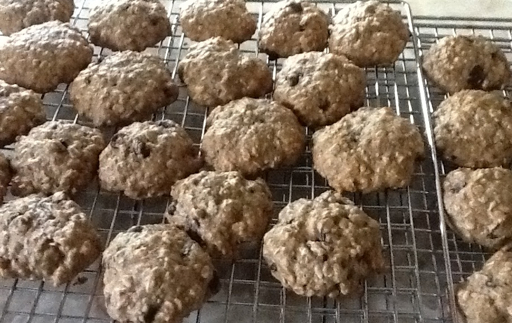 Then this afternoon, I made these banana bread cookies to take with me. They are having a 7 pm wedding and dance. We are doing pictures at 3pm and will have a light supper in their suite. I will make the maple frosting tomorrow and freeze them. 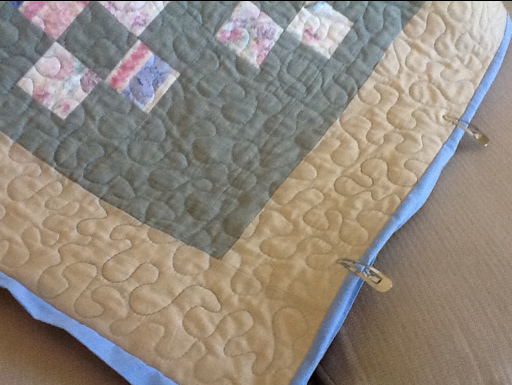 I'm just finishing up hand sewing the binding on their quilt and I also want to make a label for it. I feel quite safe to show it because my son's fiancé is off work this week and they don't have Internet at home. I will show you a full picture in just over a week once they've seen it. So that was my day. I visited my studio to look at the two pieces I'm working on. I took a few minutes to get them ironed and sandwiched. I'm already for when I do get some time. I'm lost in space ( thought) with this piece. Sometimes I can jump right into a piece, knowing or sensing right away what I want to do and how I want to do it. At other times, like now, I know what I want it to be about, but it's still a little hazy as to how I will get there. I added and rearranged a couple of bits of tulle and I know I want to add some Angelina fiber around the moons/planets. I have some but must read the directions on how to use it. You know how I love my bird photos! 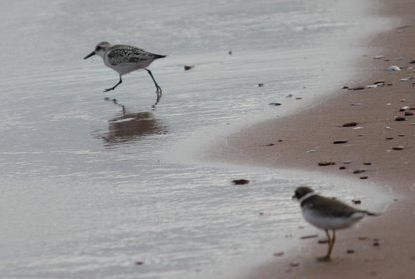 These are sandpipers seen last weekend at the PEI beach near my mother's cottage. I'm still feeling good about our lovely time away! This was the sunset view of the beach taken during one of several walks. This picture with my husband standing in the opening really shows the sandstone layers that are being slowly eroded and broken off by the ocean. Each year the cliff silhouettes recede and change in appearance. 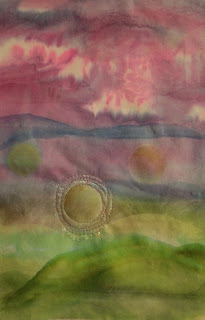 While musing about the space piece, I put together the batiks above. The center is a Bali that I discharged sometime last winter with a hand made stencil. Will it be a cushion or a table topper, I'm not sure. 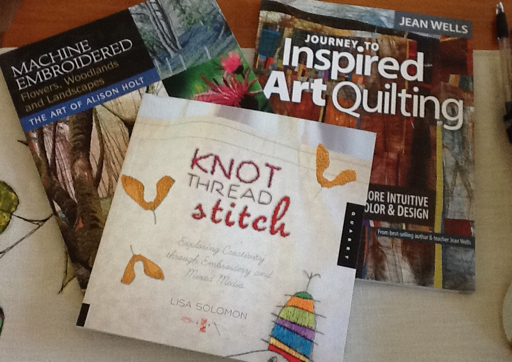 I'm going to pull out my free motion quilting books to flip through for ideas while I'm taking a break. I'm also going to bring up some space photos on my I pad. I saw a couple yesterday that we're inspiring. 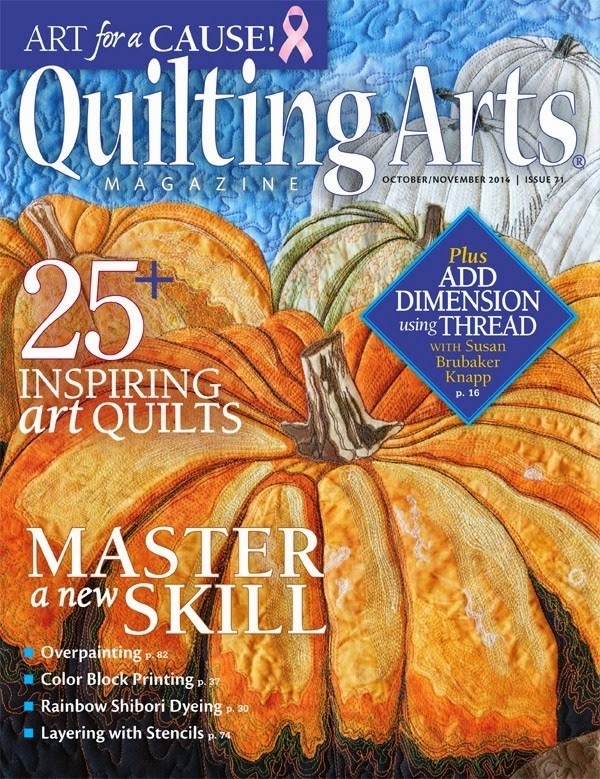 If you're a fiber artist or quilter, you may be tired of seeing my trials with the new Silks paint. I'm kind of percolating ideas right now and playing some with paints. This morning while doing my laps at the salt water pool, I was thinking about how I might use the new paints on a watercolor I did yesterday. 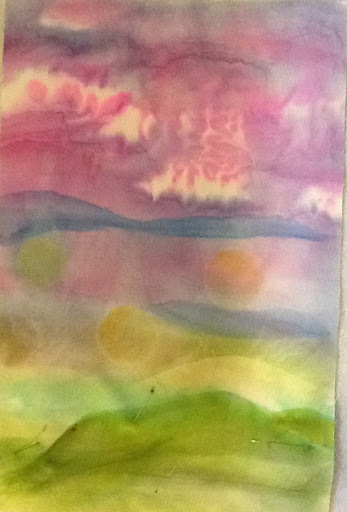 I wasn't particularly pleased with it, so I thought it couldn't hurt to try out the silks on it. I'm still having trouble preserving the highlights and I don't have any maskit nor can I buy it in town. Each exercise is a lesson learned at least. Then, this afternoon, I finally got the courage to cut into this piece of fabric and add some paint to it. I lost a bit of control over how the paint spread. In the picture you may notice the pins where I've added some tulle in the foreground. By tomorrow, I may make a couple of changes. In case it's not obvious, I'm thinking of moons or celestial bodies in space, so I plan to add lots of sparkle with Angelina fibers and beads. 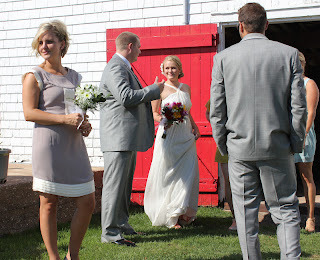 We got home last night from PEI where we attended the loveliest wedding for my only sister's eldest daughter. 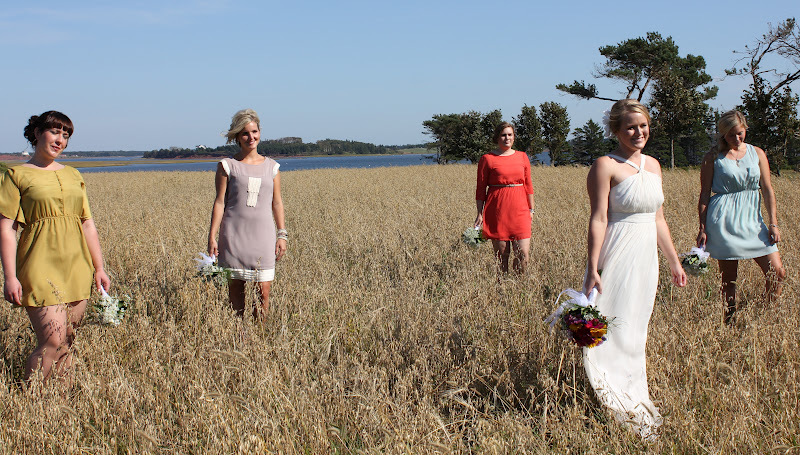 It was held outside at an old hotel with flower gardens, farmer's fields and the seashore as a backdrop. The service was held under the trees with the ocean as backdrop. It was all very relaxed and casual. I know I'm a little biased but it was a really special wedding. The whole thing was simple but elegant just like the dress. This morning after unpacking and getting wash done and hung out, I met friends for coffee. After that I had just enough time to add Silk highlights to a watercolor that I did back in June. I'm heading to Prince Edward Island today for a family wedding. We'll be staying at my mom's cottage near the beach. Also, we hope to get a game of golf in with my mother and her husband, so it will be a bit of a mini vacation for us. 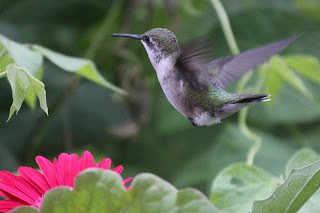 I should be back blogging early next week unless I find some wifi in my travels. 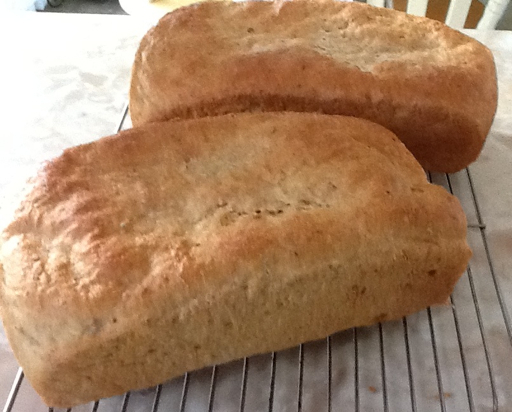 I made my latest favorite recipe for bread this morning. It is an oatmeal, spelt bread. Can you see those canyons in the top? I set the bread in the oven with the light on to rise as I usually do, but the towel that covered them was a little too damp. It stuck to the dough and I had to carefully peel it back resulting in those valleys. I had the heel already; it's my favorite part. I'm shortly going to make tea and have another piece. I know it's not part of my diet, but I've not made bread since spring and who can pass up up a fresh piece or two? When it has cooled, I will slice it and freeze it. 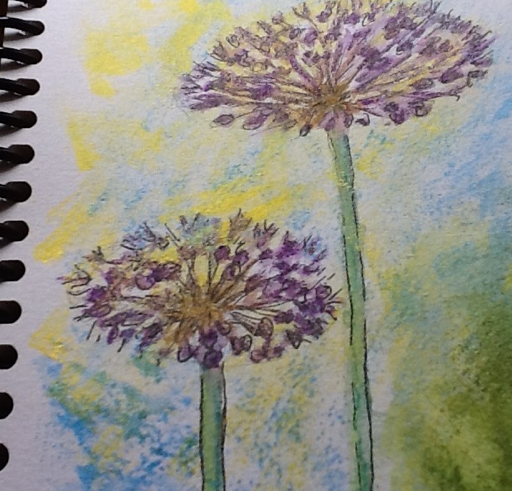 At lunch time I had another go with my watercolors and the new Silks acrylics. Still need lots of practice. 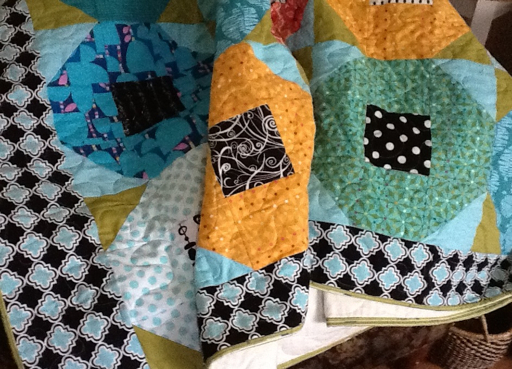 I just finished stitching the binding onto my friends first baby quilt. I will start to hand stitch it and then take it to her to finish. Do you like to use those little hair clips to hold it back as you go along? I find them really helpful. I hope you're having a great Tuesday. The sun is shining and the fresh breeze is blowing through the house. I'm off to make that cup of tea. I love this fresh, crispy, sunny fall weather! You'd think I'd be getting more fiber art done. 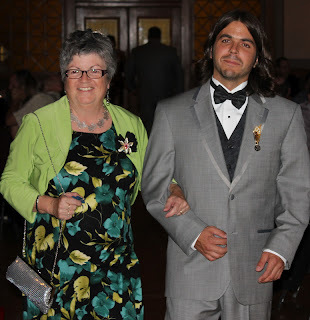 I'm getting ready for two weddings this month, my son's is one and there are always a few fall cleaning jobs too. So I sat down for a few minutes this afternoon, put together, and stuffed 3 more sachets that I will drop off to the shop downtown. I've also been busy learning about my new paints, the Silks. 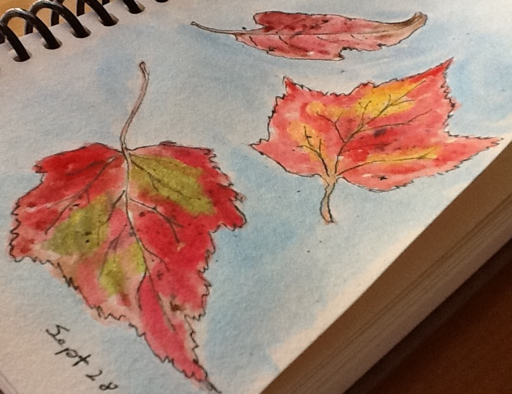 And I love doing fall walks where I inevitably pick up little bits of nature's offerings to bring home for sketching. 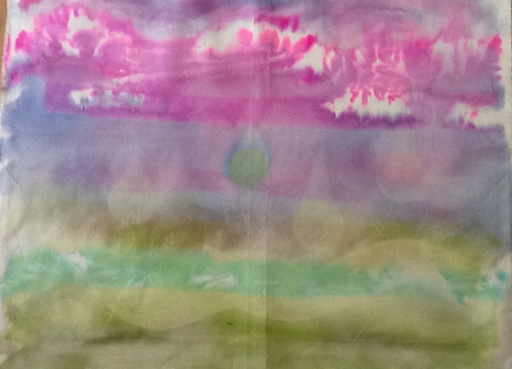 I pulled this painted fabric that I did years ago from my bin a couple of weeks ago. I've been musing about it ever since. It kind of fits my mood for something different right now. It is about the size of a fat quarter but I will likely cut it up. What do you think? Any ideas? I've got some but someone might provide a spark of an idea. 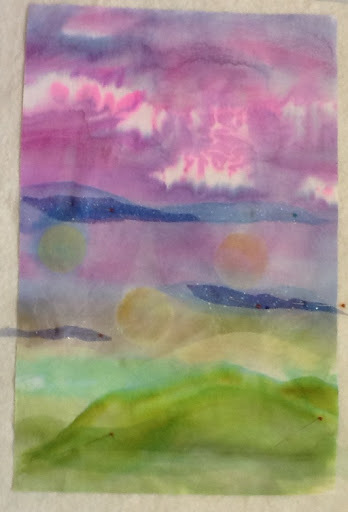 I've been playing with my new Silk paints this afternoon and I'm starting to get a feel for the possibilities. 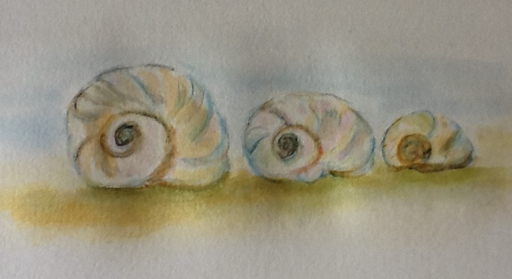 On the seashells, I used the Silks watered down and mixed together in order to obtain the grays and beiges. 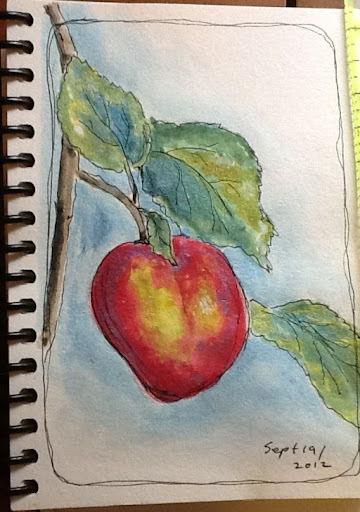 At the end I used Inktense water soluble pencils to add definition. This tomato fresh from my garden is done using basically the same method. 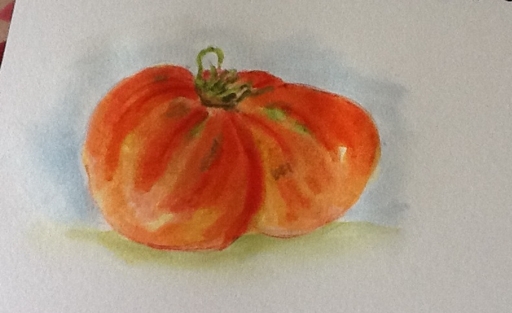 I did start with a wash of orange with Neocolor II crayons, then layered some Silks, then the Inktense.. I did this cosmos only with watercolor. The Silks are an acrylic paint with sparkly mica mixed in. 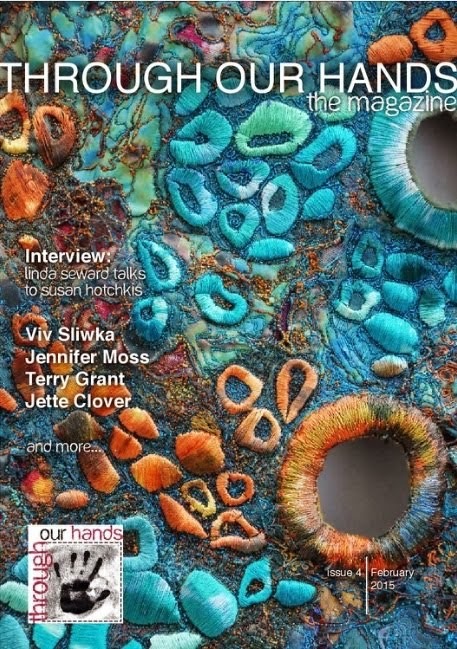 There are many surfaces upon which they can be used, fabric is one that I will be interested in. You may have noticed that I've not been buried in my fabric art lately. The turning of the weather is partly to blame, but also, I'm going to be traveling to two weddings this month, one of them my son's, and I have a couple of things to finish up for those. I love the fall and the advent of cooler temps. It makes me feel at one with the world and content. As always I'm always open to the world around me, but more so in the fall. I like want to go for nature walks, and to come home with little inspiring bits to sketch and paint. There are always some little fall cleaning jobs that need to be done too. So, today I feel good to have sewn and stuffed 3 more little lavender sachets for the shop downtown. You can see the pins in the openings, I've not stitched them closed yet. This is a piece of painted fabric that I did a number of years ago. I found it in my bin as I was putting things away. I've been thinking and musing about it for the last couple of weeks. That's kind of what I do before starting a new project. I have some inspiration but whether I get to it or not we'll see. It's actually quite large, about the size of a fat quarter, so I will likely cut it up. What do you think? I definitely have a direction in mind but someone just might spark up an idea! 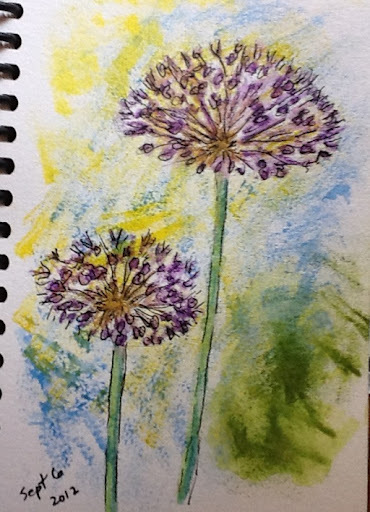 I've been out for a walk with friends today and then I played some more with my new paints, with nothing really blog worthy to show. I'm going to a UFO day tomorrow and it's going to be a busy week. 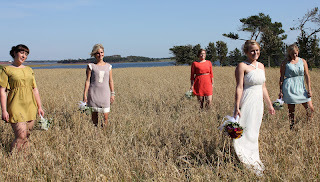 I have a few appointments getting ready for a wedding in PEI on the weekend. 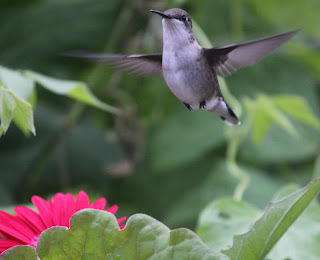 I caught this little hummer yesterday through my kitchen window. Although it seems large here in the cropped photo, it seemed pretty small. They must be going to leave soon. The Silks paints that I ordered for Dion Dior's class, A Taste of Silks, finally arrived this morning. I had actually driven down to Chal Baie to do my few volunteer hours, but the manager had a cold and I opted not to stay. It is a fairly small space and with a compromised immune system and two weddings coming up, I decided to come home. The paints were waiting or me. 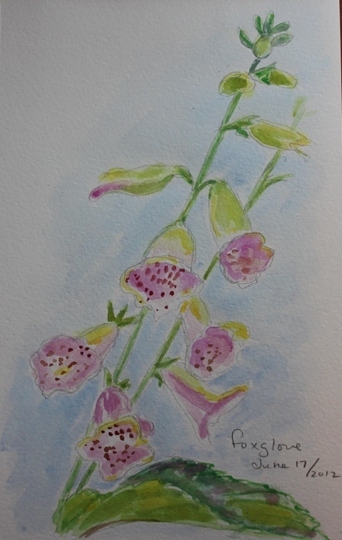 Of course I wanted to try them right away, so I did a little drawing based on one of the photos from my garden. What are those things, anyway? They're of the onion family ; I've lost the name. 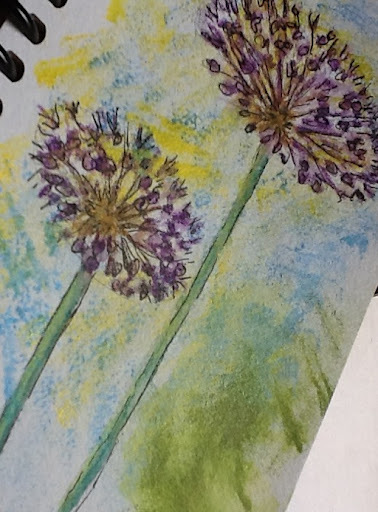 I used my Neo Color II crayons to add the colors on the flower. Then the plan was to sponge on some of the shimmering Silk paint. The only sponge I could find in the house was a sponge brush which resulted in angular shapes. Now I can see they would have worked nicely a bit watered down and with a better sponge. I tried to capture some of the shimmer inherent in the Silks. I need to go sit down and do a little more reading before I try again. I think they're going to be fun once I loosen up a bit! Between my flu last week and a day trip yesterday, I've barely sewn for a week. Today was my swim day tooand that's always a priority. After my lunch, I made up this fish stew which I found on line. Then I made banana cornmeal muffins to go with it. My husband and I had it for supper, but I also took some to a friend who just had some surgery. And, for those who know me, of course I made a few changes. The recipe called for chopped tomatoes, which I did, although not as much as was asked for in the recipe. 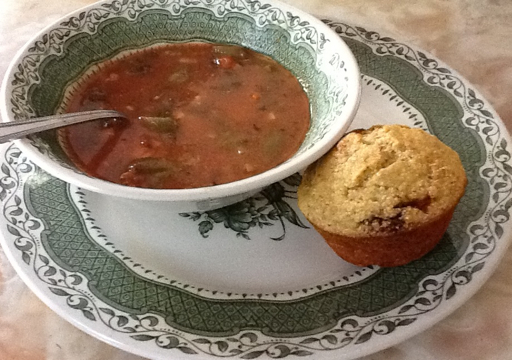 I added some canned crushed tomatoes, a few slivered freshly picked green beans, and a can of clams plus the juice. Oh, and besides the fresh parsley, I have lots of basil, so that went in too. 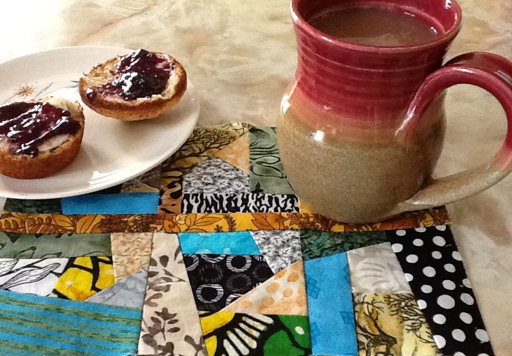 Just to get my bit of sewing fix since it's been so long, I put together the top of another mug rug from some extra squares that I pulled out of a bin. People seem to really appreciate them as gifts. I want one myself too! It will be another good little piece on which to practice some free motion. This bit of flu has really knocked me down. The symptoms ceased yesterday morning, but I remain very fatigued. My simple doodles are not all that interesting, but it's the only thing I've done in the last few days. I've filled half a sketchbook! I'm almost ready to send a couple off to Margaret to make the screens. I just have to select a couple! Decisions, decisions! I was trying out several versions of the one that Margaret used for a design in my last post. It's kind of addictive and really helps pass the time when under the weather.